I just have not been doing much pastel painting lately. I still adore pastels but am sort of at a standstill with them. I can't seem to sell any paintings, and I don't have room in my house to keep storing them framed, and I hate to just squish them in drawers or throw them in the trash after spending so much time on them. So my solution lately has been to give up painting. Better not to paint at all than to have to paint and trash or stash. But I recently joined the Jacksonville Artists Guild and they are doing a project for the Jacksonville Zoo as a fundraiser. 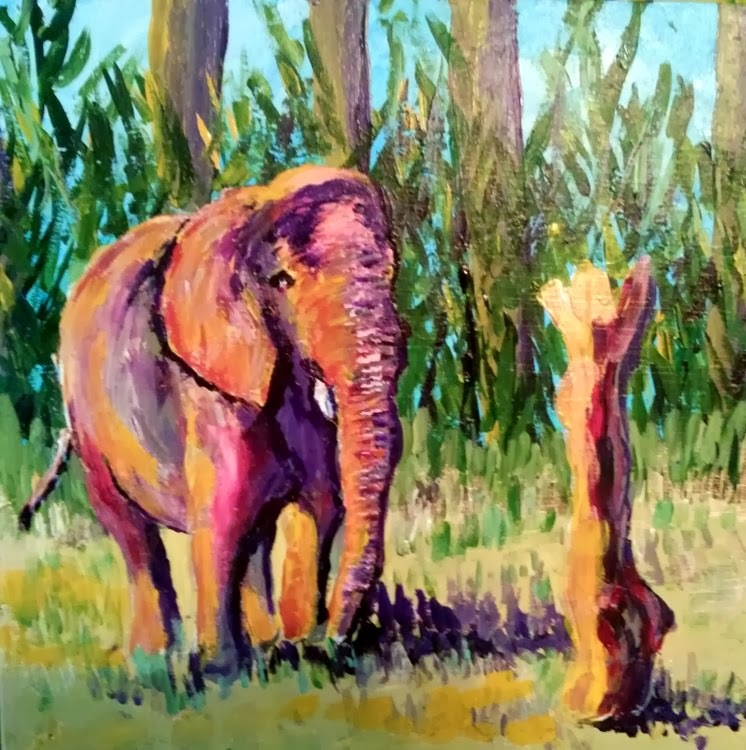 Members are allowed to take one or more 8-inch-square wooden boxes to paint, and these will then go to the zoo to be on display, then to the airport, back to the zoo, and then sold as a fundraiser. So no need to worry about storing them in my home. The plain boxes are like the one above, and about 1 1/2 inches deep on the side. So I took three of them to paint, and started by giving them each three coats of gesso. The problem, of course, is that you can't use pastels on the boxes. They can't be framed under glass. And pastel is the only medium I enjoy or feel comfortable with. I hate watercolor, hate oils, hate acrylics. Pastel is my love! So what to do? I do have lots of zoo photos at least, from trips I have made there with my grandson. And I took three boxes to work on! So I had to plan something. So this is my first attempt. I took a photo I had of a giraffe and used photo editing software to play with the colors to make it more "playful" looking rather than just a standard giraffe. I liked the colors in this one and had then planned to paint it. 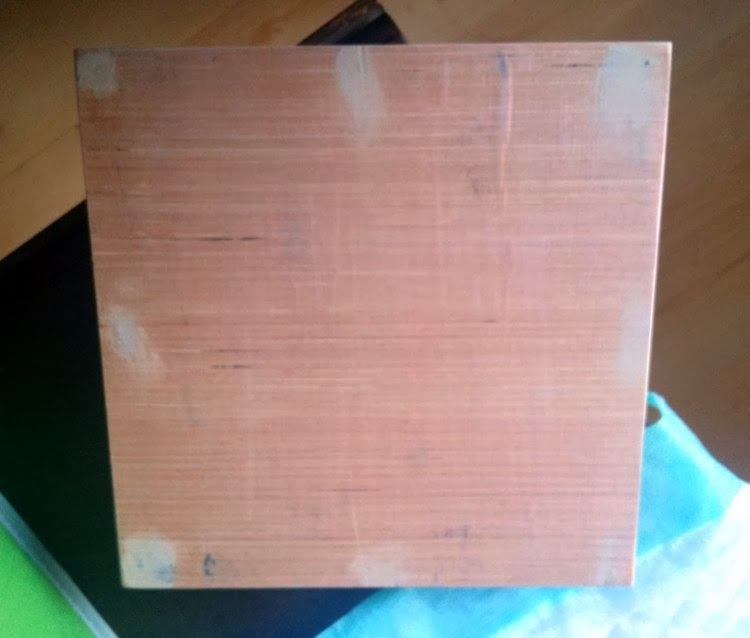 But I decided, heck, the photo was also my own artistic creation, so I just printed it out, and decoupaged the photo to the box. Added some acrylic touches, decoupaged on some sticks and artificial flowers. Then painted the sides of the box with acrylic, including carrying the giraffe's neck down onto the side of the box, and glazed over the whole thing, and in general I was pretty happy with it, so then was ready to try an actual painting. So today I tackled this elephant with acrylic. Again, acrylic is not my medium. It's an exercise in frustration and I don't find it fun as I do pastels. But I worked away on it and this is what I accomplished today. I'm not really happy with the elephant's trunk. I've redone it about 3-4 times and touched it up a few more than that but can't seem to get it the way I'd like. But I'm not displeased with the rest of the elephant, and the rest of the painting in general. I'll have to see what I think tomorrow. Annoying thing about acrylic though is that tomorrow I won't be able to mix up exactly the same colors I used today. We'll see. The trunk actually looks a bit better in person than it does in this photograph, so I might just leave it as is. Still have one more box to paint however! Debbie, I loved these! I too love my pastels, but I really want to branch out a bit and am going to try my hand at oils again...maybe water soluable so I'm not using thinners...keep up the good work. Sometimes playing like you did really brings out your creativity.